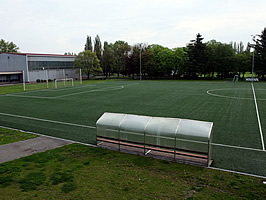 Football Camp is organized at Sport Center Duhová Energie Nymburk. This sport complex is the best sport centre in the Czech Republic where the top sportsmen and teams of different sport branches from the Czech Republic and abroad prepare. Czech football teams of Gambrinus league but also football teams from Poland, Austria, Russia and Hungary have their preparation training camps for the next season here. Training sessions are going to take place at the sport centre where are 4 turf fields, 2 fitness centers, 3 gyms, swimming pool and Jacuzzi. All these sport facilities are available for the high quality training to all participants of Football Camp. Part of the centre is a *** hotel where player are accommodated and the dining room where the players eat during the camp. The meals are caloric balanced, prepared especially for the athletes with a busy day schedule. All service with the training sessions is on top professional level!